Monday Night Football features the Philadelphia Eagles and Washington Redskins tonight, two teams fighting to stay alive in the NFC playoff picture. With both only a game or two back of Dallas in the NFC East, the outcome is of serious interest to Cowboys fans. So, the question is, are the Cowboys better off with the Eagles or Redskins winning tonight's game? After their big win last Thursday over the Saints, Dallas moved to 7-5 and sole possession of the NFC East lead. That could change tonight, though, if Washington wins. New York Giants -- HA! The superficial view would say that we clearly want Washington to lose tonight, dropping them a full game behind Dallas and preserving our top spot in the division. But while that sounds nice, it's also more of an immediate gratification. Is it really the best thing in the long run? A Redskins loss naturally means an Eagles win. It would move Philly to 6-6, just a game back of Dallas, and with the same 3-1 record against NFC East teams. It would mean that next week's game between the Cowboys and Eagles would be for the division lead. Cowboys RB Ezekiel Elliott puts an Eagles defender on a poster. Sure, Dallas beat Philadelphia in their own house a few weeks ago. But a win tonight would give the defending Super Bowl Champions a big boost, knowing what they could accomplish a week from now. In the end, all Dallas has to do is keep winning to take the division. Even if Washington were to also win out, the Cowboys would have the edge on them with the "common opponents" tiebreaker. Dallas would have a 5-3 record against the AFC and NFC South teams. The best the Redskins can now finish with is 4-4 record against the same teams. So that's one point in favor of a Washington win tonight. It would be a virtual kill shot to the Eagles' season, hopefully sapping their motivation next week. If all Dallas has to do is keep winning, something that softens up an opponent is a plus. Another point is looking at the quarterback situation for the Redskins. Even if they upset Philly tonight, they still have Colt McCoy the rest of the way. Do you really see Washington going on a big run in December? On the other hand, Carson Wentz is still one of the most talented passers in the NFL. He's far more capable of getting hot and galvanizing his team. It comes down to probability. 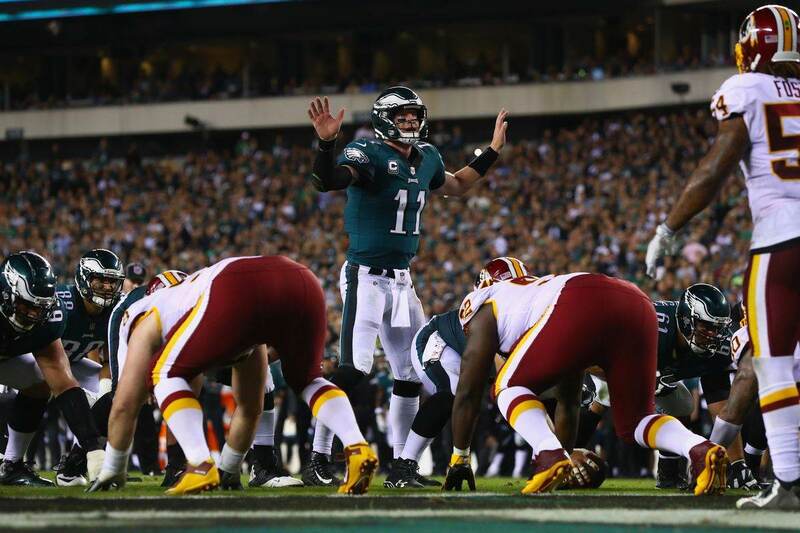 Which team is more likely to post a better record over the last four weeks of the regular season; the McCoy-led Redskins or the Wentz-led Eagles? That's an easy answer based on perceived team strength. However, there's another aspect to that question we have to look at. What teams are on Philadelphia and Washington's schedules the rest of the way? Dak Prescott, Cole Beasley, and other Cowboys celebrate a touchdown against the rival Redskins. After they come to Dallas next Sunday, the Eagles stay on the road to go play the 11-1 Los Angeles Rams. Then they come home for 9-3 Houston Texans. They Week 17 finale is on the road for a rematch with Washington. The Redskins host the hapless Giants (4-8) next week, then go on the road to face the Jaguars (4-8) and Titans (6-6) in Weeks 15 and 16. So this really does add a new wrinkle to the conversation. The Eagles have a much tougher road ahead, facing three teams with winning records. The best team on Washington's schedule are the Titans, who are average at best. It brings us back to the idea of probability. The Eagles may have the stronger team going forward, thanks largely to their quarterback advantage. But does the stiffer competition ultimately make them less likely to win? Based on what we've seen this year, you'd have to answer "yes." Philadelphia hasn't looked anything like the Super Bowl team from last year, and the thought of them beating the Rams or Texans right now seems laughable. On the other hand, even with Colt McCoy at QB, Washington could pull off some wins against their much weaker opponents. Teams like the Giants and Jaguars may be more concerned about their draft positioning at this point then actually winning games. So, in terms of what's best for the Dallas Cowboys, it would seem that getting some distance from the Redskins is in our best interests. While it does infuse the Eagles with some extra mojo for next week, Dallas still controls its own destiny with a win. Even if Dallas were to slip against Philly next week, they'd have good odds for retaking the NFC East once the Eagles finish out their December schedule. If Washington keeps hanging around, though, all they need is one Cowboys loss to potentially steal the division. It's a slim margin, sure. Dallas arguably benefits either way tonight. But all things considered, looks like we should root for the Eagles tonight.